After several years of learning in workshops with Briski, the kids created their own photographs with point-and-shoot 35 mm cameras. Their images capture the intimacy and color of everyday life in the overpopulated sections of Calcutta. Proceeds from the sale of the children’s photographs go to fund their future education. 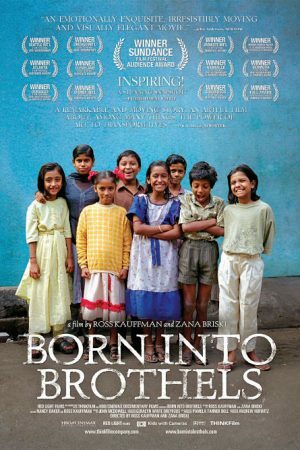 Directed by Briski and filmmaker Ross Kauffman, Born Into Brothels was shown at the Sundance Film Festival in 2004 as part of the documentary competition. The photography is splendid, rich in color and subject matter, and the video camera following Briski through the squalid red light district, pausing to hear abusive mothers and drugged fathers deny their children passage into a better life, hearing the wisdom of the elders who desire something more for these children, captures a world few know. Devoted as Briski and Kauffman are to their dream, they remain realistic and document an element of life in a third world country that is illuminating. This is a touching film without being maudlin, beautiful without ignoring reality. In English and with subtitles for the children’s commentary. On March 11th 2011 Japan was hit by the greatest tsunami in a thousand years. Through compelling testimony from 7-10 year-old survivors, this film reveals how the deadly wave and the Fukushima nuclear accident have changed children’s lives forever. “IRL – In Real Life” is a short, light-hearted documentary, which takes a look at the effects of World of Warcraft addiction/compulsion. This award-winning documentary film, shot in Vancouver, Canada’s notorious Downtown Eastside, caught the eyes of audiences, film makers and critics world wide for its unusual and sensitive depiction of life on the street. Director Kate Blewett visits a children’s care home in Bulgaria and investigates the conditions in which the children live. Following the completion of the film, the production team offered the Bulgarian Embassy in London the opportunity to comment on the findings made in the course of filming the documentary: The Social Care Home – where 75 unwanted children are growing up – is the main employer in the small village of Mogilino. Stepping Into the Fire is the cinematic release that reaches into the ash of the bare bones of existence and asks the question “is humanity born to die, or is humanity born to live?” The film follows the true story of three successful individuals brought together by an ancestral medicine from South America that has become legendary for its miraculous and profound effects.